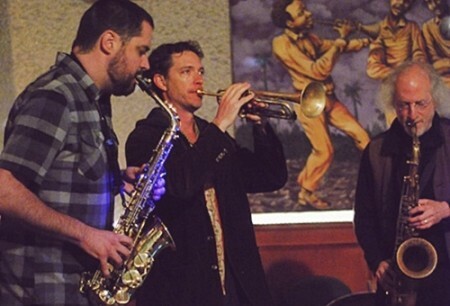 Forming in 2015, this all-horns free-improvising trio came together when Rempis journeyed to the West Coast to discover some things about his compatriots on the Bay Area improvising scene. From the first few notes, their initial meeting flowed comfortably, yet in totally unexpected ways, with all three making logical structural decisions that gave their improvisations the feel of through-composed pieces. Not satisfied with simply existing in the moment, these three combine sensibilities to look many moves ahead, setting each other up time and again to capitalize on structural possibilities that give rare and meaningful form to an otherwise very spontaneous music. (Listen here.) They stop in Seattle on a tour to celebrate their new album, Neutral Nation (Aerophonic Record)s.
Dave Rempis began his musical studies at the age of 8, inspired by a family friend who played clarinet in local Greek bands, and by Zoot, of the Muppets Band, to pick up saxophone. During high school he performed in his town, district, and all-state bands and wind ensembles, as well as in a jazz combo at a local music school. During his tenure with The Vandermark Five, Rempis also began to develop the many Chicago-based groups for which he is currently known. These include The Rempis Percussion Quartet, The Engines, The Rempis/Rosaly Duo, The Outskirts, Ballister, The Rempis/Daisy Duo, Bishop/Rempis/Kessler/Zerang, and Wheelhouse. Past working groups include Triage, and the Dave Rempis Quartet. Many of these groups have been documented on the Okkadisk, 482 Music, Not Two, MultiKulti, Solitaire, and Utech record labels. Rempis also performs and tours with Ken Vandermark’s Territory Band and Resonance Project, and The Ingebrigt Haker-Flaten Quintet. Past collaborations have included performances with Paul Lytton, Axel Dörner, Peter Brötzmann, Hamid Drake, Steve Swell, John Tchicai, Roscoe Mitchell, Fred Anderson, Kevin Drumm, Paal Nilssen-Love, Nels Cline, Tony Buck, and Joe McPhee. Rempis has been named three times in the annual Downbeat Critics’s Poll as a rising star in both the alto and baritone saxophone categories. Since settling in San Francisco in 1997, Canada-born trumpeter/composer/songwriter Darren Johnston has collaborated and recorded with an extremely diverse cross-section of artists, from straight-ahead jazz luminaries such as bassist/composer Marcus Shelby, to experimental icons like ROVA, Fred Frith and Myra Melford, rising star in the singer/songwriter world like Meklit Hadero, or traditional Balkan brass band giants Brass Menazeri. As a bandleader he has made his mark with the award winning The Nice Guy Trio, The Darren Johnston Quintet, the category defying Broken Shadows, and more. Johnston was featured as one of Downbeat Magazine’s “25 Trumpeters for the Future,” and has been listed multiple times in the critic’s polls. His debut quintet recording, “The Edge of the Forest” received four stars by four very different critics in the Downbeat “Critics Polls,” and was given an honorable mention by the Village Voice for the top 10 CDs of the year. Johnston has a BA from the Cincinnati Conservatory of music, and an MFA in composition from Mills College. Johnston currently teaches privately, at the Community Music Center in San Francisco’s Mission district, the Oakland School for the Arts, and as adjunct faculty at the University of California, Berkeley. As a member of Rova Saxophone Quartet since 1977, Larry Ochs has made more than two-dozen CDs and 40 tours to Europe and Japan. He has recorded dozens of CDs with his other touring bands including Larry Ochs Sax & Drumming Core with Scott Amendola, Don Robinson, Satoko Fujii, and Natsuki Tamura, and Kihnoua with vocalist/performance artist Dohee Lee, Scott Amendola and special guests. He is performing in and composing for more “collective” bands such as: East-West Collective – with Didier Petit, Sylvain Kassap, Miya Masaoka, Xu Fengxia; Ochs-Robinson Duo with drummer Don Robinson; Jones Jones – with Mark Dresser and Vladimir Tarasov; Maybe Monday – with Miya Masaoka and Fred Frith; Shelton-Ochs Quartet with Aram Shelton, Kjell Nordeson and Mark Dresser; and Trio Dave Rempis-Darren Johnston-Larry Ochs. He has performed with Kronos Quartet, John Zorn, Steve Lacy, Anthony Braxton, Nels Cline, John Lindberg, Scott Amendola, Andrew Cyrille, Butch Morris, Marilyn Crispell, Henry Kaiser, Wadada Leo Smith, Peggy Lee and many others.